Scooter Saddle Bag Medium Holdall With Side Panniers. These scooter saddle bags have been designed to allow your scooter to carry the weight. They provide a rear holdall and two side panniers. It has a reflective strip on the rear pouch for added safety. 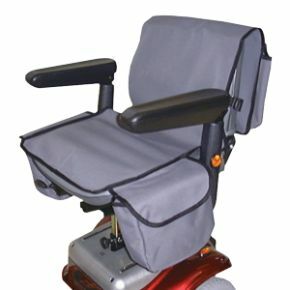 This is the standard saddle bag for use with most mid-range scooters. It is available in a choice of Navy, Grey or Maroon. Was pleased to find this product at Active mobility, my previous scooter saddlebag had become faded after about 10 years use this replacement is as good quality as the previous purchase and expect it to last very well, it was delivered in good time and condition. Will deal with this company again.